Home » Game Reviews » Things Are Getting Spooky With Pumpkin Patch: Bad Seeds! 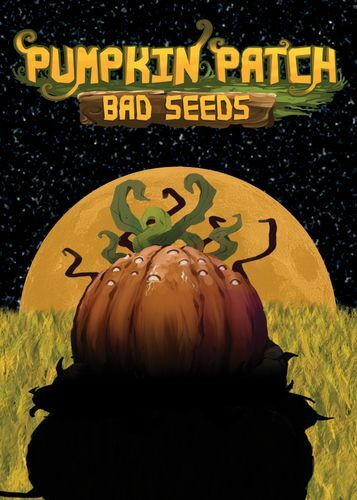 Things Are Getting Spooky With Pumpkin Patch: Bad Seeds! Written by: KristaG on July 11, 2018. As with any gardening endeavor, there is always a chance of having a few bad seeds. In the case of Pumpkin Patch: Bad Seeds, however, this doesn’t simply mean that they don’t grow! On the contrary, these seeds have sprouted with a few genetic mutations and seem to defy nature itself! Players of this quick card game will have to compete with each other to not only collect the most seeds from these horrifying abominations, but also try to spoil their opponents’ attempts to do the same! Though typically the time to plant pumpkins is between May and June, there are still some opportunities to plant them in early July! This seems to work out perfectly as Pumpkin Patch: Bad Seeds will be hitting Kickstarter.com this week! Pumpkin Patch Bad Seeds Components. (All photos of Brouhaha Games product were taken and edited by KristaG unless otherwise stated). Designed by Travis Drake and filled with stunning artwork from Viktor Koch, Pumpkin Patch: Bad Seeds is launching on Kickstarter in just a few days. Not only that, though, but it is also the first game from Brouhaha Games and, in my humble opinion, is a stunningly beautiful game to use for a new company debut! This easy to learn, lightweight card game is playable for 2 or 3 players and can be played within mere minutes – usually less than 15! The game itself comes with a deck of cards, a score tracker, player markers, and a set of rules. For this particular review, we will be using a prototype copy so some of the components may change once the game is actually published. Pumpkin Patch: Bad Seeds is a game that has a particularly easy setup. To begin, players should first set up the play area. Starting by placing a Baby Boo card in the center of the play space, 4 Seedling plots are then placed orthogonally around it. Each of the 2 Crow cards are then placed on the Seedling plots; one to the left of Baby Boo and one to the right. Next the “compost pile” is set up. The compost pile is made up of 6 cards: 3 Seedlings, 2 Jack be Littles, and 1 Baby Boo. They are placed near the play area in a pile in numerical order from lowest to highest. The remaining cards are shuffled and placed face down as a draw deck with space next to it being utilized as a discard pile. Each player will then draw 3 cards to create their starting hand. 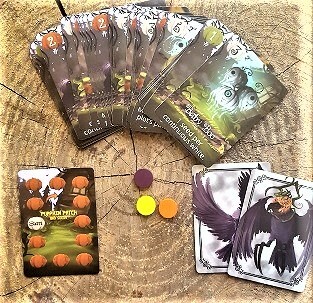 In a 2-player game, each player is then assigned a Crow card. Each player will also get a colored player marker, which is placed on the “Start” pumpkin on the score track. The first player is chosen by determining who has carved the most pumpkins in their life (I think this is the only competition I have ever won when it comes to choosing a first player! ), but we have also done it by merely picking at random. Once the Cinderella pumpkin makes its appearance, the game immediately ends. There are 4 Phases during a player’s turn that must be followed in order: Play Phase, Crow Phase, Discard Phase, and Draw Phase. The phases remain the same regardless of playing a 2-player or a 3-player game. 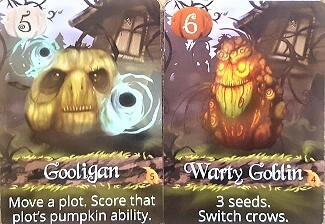 During the Play Phase, players may either plant on a plot using a card from their hand or from the top of the compost pile. Each of the cards will have effects written on them. These can include things such as moving a plot and scoring that plot’s pumpkin ability, gaining a seed for every adjacent and diagonal plot, or starting a new plot. When playing cards, however, they must be played in ascending numerical order and, should a player be starting a new plot or moving an existing one, all plots must be continuously touching via an adjacent side. Should the player not be able to play a card during their Play phase, they must discard their hand and skip ahead to the Crow Phase. In a 2-player game, the player will move their assigned Crow card to any open plot on the board. In a 3-player game, players may move either Crow of their choosing. Crow cards block off plots so they can not be moved or further planted upon. A player may choose to discard as many cards from their hand as they’d like during the discard phase, which can be quite advantageous at times to try and swap cards out in attempt to get ahead for upcoming turns! Players will then draw back up to their hand size of 3 and play will continue on to the next player. If a player is unable to draw due to the deck being empty, the discard pile is simply reshuffled so play can continue. 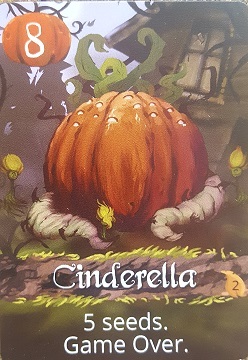 The moment the Cinderella pumpkin (#8) is played and its seeds (points) are collected, the game immediately ends. The player with the most seeds is declared the winner. My two favorite pumpkins in the game! How could anyone not love those faces? As I’ve mentioned a few times, I love the artwork of this game. I can’t seem to get enough of it. Viktor Koch did an absolutely amazing job and these designs are eye-catching and I could not say no to trying this game even if I wanted to based on the art alone. I am also really happy to see that not only were orange pumpkins included in the game, but the white varieties as well! It’s not often that I see them getting attention unless they’re plastic or Styrofoam and sitting outside a craft store in the fall. I think my favorite pumpkins of all, though, are probably the Gooligan and the Warty Pumpkin. That being said, the game itself was really easy to learn and played quickly enough that my Player 2 and I were even able to play through it a couple of times while sitting down at the laundromat while waiting for our laundry to finish up. I did have a couple of rules related questions the first few times we played as a full group, but they were pretty easily answered as we passed the rules around and came to a general consensus on. To be honest, I’m still not sure if my confusion was based on the way something was written and just not clicking or if I had legitimately just missed something while reading through the rules. Overall, though, the rules are really easy to understand and Pumpkin Patch: Bad Seeds is a game that one can just dive right into and play after a quick read through of the rules, which is nice. I think my only pet peeve is the score tracker. There are 11 pumpkins on the tracker and it’s easy to not only score 11 pumpkins, but surpass it several times over while playing. Having the final marker stop at 11 also makes the math a little weird when adding up the final scores. Likewise, lapping other players was a bit of a problem as it caused a lot of confusion and it was all just a mess. We ended up not using it at all; choosing instead to simply use a notepad and pencil to keep track of things. I’m hoping that gets changed by the time the Kickstarter campaign reaches its completion. I really do like the game as a whole, though. It plays quickly, is something I can play with both kids and adults with only a little reading involved, and has a surprising amount of strategy involved. The more we played, the more tactical our games became. I do tend to like the 3-player version better than the 2-player, however. I’m not saying it doesn’t scale well, but I like having the added element of another player’s involvement and not being restricted in which Crow I can move (though I do understand why it changes in a 2-player game). 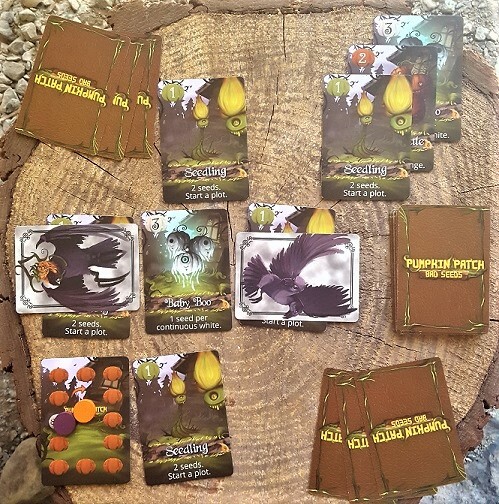 The campaign for Pumpkin Patch: Bad Seeds launches July 11, 2018, so be sure to check it out!